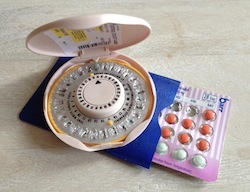 Oral contraceptives have long been associated with an increased risk of deep venous thrombosis (DVT), a risk that is heightened when the woman taking birth control pills is also a smoker or has lupus. Since it was first approved for contraceptive use in 1960, the pill has gone through a series of evolutions that make this form of contraception safer and more effective. The newest version of the pill, however, increases the risk of dangerous DVT blood clots. Deep venous thrombosis is diagnosed when a clot forms in a vein deep inside the body. Most DVTs occur in the thigh or lower leg. A clot that breaks away from the wall of the vein and moves freely through the bloodstream is an embolism, or venous thromboembolism (VTE). An embolism can travel through the body to the heart, lungs, or brain, where it can get stuck in a smaller vein and block all blood flow to or from the area. When blockage occurs, the loss of blood to vital organs can trigger strokes and heart attacks. Yana Vinogradova, a medical statistics research fellow at the University of Nottingham, England, United Kingdom, led the study which involved analyzing data gleaned from two UK medical databases. The researchers were looking for women, 15 to 49 years of age, who were diagnosed for the first time with venous thromboembolism from 2001 through 2013. For each woman in the study group (diagnosed with VTE), five women were selected for the control group (no VTE); each group of six study participants were the same age and under care at the same medical facility in the same year. The study group consisted of 10,562 women with VTE. Older formulations increase the risk of VTE by 2.5 times. Newer formulations increase risk by 3.6 to 4.3 times. Older pills contain levonorgestrel and norethisterone. Newer versions contain cyproterone, desogestrel, drospirenone, or gestodene. Older oral contraceptives containing levonorgestrel and norethisterone increased the number of VTEs by six cases per 10,000 women taking the contraceptive. When newer pills containing cyproterone and desogestrel were taken, VTE diagnoses grew to 14 cases per 10,000 women. Globally, approximately 9% of all women of childbearing age (15 to 49) take oral contraceptives. In developed countries, oral contraceptive use is approximately 18% on average. In the UK, where the study was based, approximately 28% of all women of childbearing age use oral contraceptives. Even though the risk of VTE is as much as 4.3 times higher in women taking birth control pills when compared to those not taking oral contraceptives, the researchers indicate the risk of VTE during pregnancy is 10 times higher than when not pregnant. Vinogradova, Yana, Carol Coupland, and Julia Hippisley-Cox. "Use of combined oral contraceptives and risk of venous thromboembolism: nested case-control studies using the QResearch and CPRD databases." The BMJ (2015). Web. 9 June 2015. "Deep venous thrombosis." MedlinePlus. US National Library of Medicine, 24 Feb. 2014. MedlinePlus Medical Encyclopedia. Web. 9 June 2015. Previous: Is Social Media Fueling Rise in STD Cases?